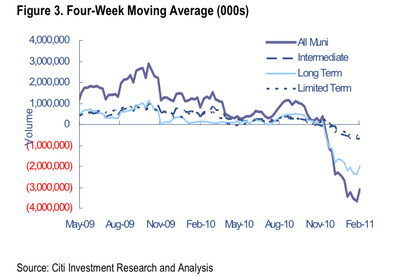 The latest look at the muni market from Citigroup is pretty interesting. First, guess who’s buying all those munis that mum & pop are dumping? Hint: the smart money. We have seen a significant increase in interest in tax-exempts from the latter sector, corporate bond funds, in recent days. A key reason for this, in our view, is most corporate bond funds are managed as part of a family of funds that also include tax-exempt funds, and, in these cases, the knowledge base that already exists on the tax-exempt side is being utilized to point out opportunities for crossover purchase. In most cases, crossover buying is limited to parts of the muni market where there does not appear to be any imminent credit risk, including double-A or better GOs, essential service revenue bonds rated A1/A+ or better and very high-quality hospital bonds. There was considerable demand from crossovers on two highly rated hospital credits that sold last week, for example. So the dumb money is selling, and the smart money is buying. And as for that dumb money, even their dumping may be coming to an end. Note a sharp uptick in the 4-week moving average of muni outflows. It’s still negative, but clearly abating.